7=5 during 04 March - 31 March 2014! 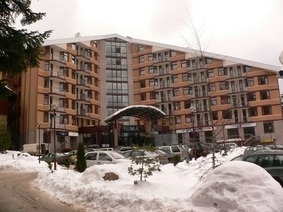 Location: The building is located in the central part of Borovets resort, just 50 meters away from the ski lift and 20 meters away from the beginners slopes. The Flora apartments provide luxurious accommodation where you can enjoy a winter holiday with the whole family while engrossed in the splendour of Bulgaria's most famous ski resort. Accommodation: Flora Apartment complex is a brand new building with studios and one-bedroom apartments equipped with self-catering facilities. Studios are suitable for up to 2 adults; The one bedroom apartments can sleep up to 4 adults. The apartments offer comfortably furnished bedroom and a cosy living room with folding sofa. All apartments offer fully fitted kitchenette with all modern appliances. Comforts in the complex: Flora apartments offer an Indoor Swimming Pool, Jacuzzi, Fitness Centre, restaurants and a bar. The complex provides easy access for disabled people. * The Flora Apartments complex also provides the following facilities.